1. A 23-year old woman is seen in clinic for fatigue and was found to have a hemoglobin of 52 by her family doctor. On further inquiry, she has a history of palpitations over the last few weeks and occasional shortness of breath. Her history is significant for menorrhagia for which she had recently been placed on an oral conceptive agent. She denies any recent travel, no new medications apart from the OCP, no exposure to any sick contacts. She denied any history of hematemesis nor melena in her stools. On examination she appears quite pale with no scleral icterus. She had no lymphadenopathy, abdominal examination revealed no splenomegaly. Her vitals: 102/58 mm Hg, 122 bpm, Oxygen saturation: 98% on room air. Hemoglobin: 52, MCV: 75; WBC: 9; platelets: 475 x 10 ^9. Ferritin : 6; Total iron: 10; iron saturation: 3%. What are the next steps in the management of this patient? A. Arrange follow-up in a few weeks to see if hemoglobin improves. B. Start ferrous gluconate 300 mg daily. C. Arrange for IV iron. 3. A 65-year old man is referred to clinic by his GP after routine blood-work showed an abnormality in his immunoglobulin levels with an elevated IgM of 24g/L and M spike on SPEP. He has had no recent infections and is otherwise healthy with no current medications. The complete blood count, creatinine and calcium are normal. He also had a skeletal survey that showed no osteolytic lesions. His serum free light chain and immunofixation along with a 24-hour urine for Bence-Jones urine assessment were unremarkable. You arrange for a bone marrow aspirate and biopsy, which showed 4% plasma cells with IgM restriction on flow cytometry. Which of the following is this patient most likely to develop in the future? 1. C – This is a patient with symptomatic microcytic anemia from severe iron deficiency likely from her history of menorrhagia. In a patient with the degree of iron deficiency and symptoms she has at present, there is a more urgent need to replete her iron stores. Ferrous fumarate contains about 33% of elemental iron, ferrous gluconate about 12% of elemental iron and these oral supplements can cause significant constipation at higher doses. Whereas IV venofer contains 20mg/mL of elemental iron so a 5 mL administration can provide 100 mg of elemental iron with one dose. Additionally, given her symptoms she may also benefit from one unit of packed red blood cells. Importantly, you should recognize this is a symptomatic patient from anemia and also order your relevant studies including iron studies before transfusion. Read more about iron deficiency anemia on Medscape. 2. 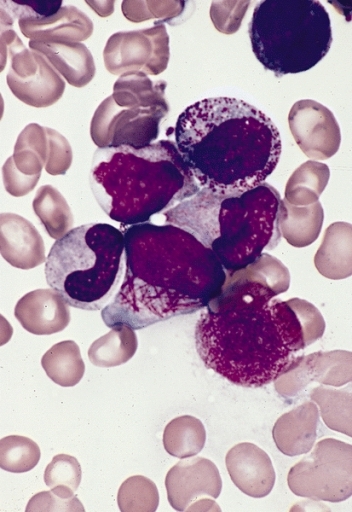 B – this patient’s blood film showing Auer rods and clinical history is very in keeping and suggestive of leukemia. The concerning feature in the blood work is the elevated clotting times and this should raise suspicion for the diagnosis of APL (acute promyelocytic leukemia) formerly known as M3 acute myeloid leukemia in the FAB classification system. This is an emergency and these patients should be seen in concert with a hematologist. The treatment regimen entails ATRA (all trans-retinoic acid) as well as cryoprecipitate typically to address the dysfibrinogenemia by the latter. Recent trials have shown that these patients also do well when on Arsenic trioxide is added to therapy with ATRA. Long term prognosis of this disease is very good, it is the immediate and early complications from DIC is the most concerning feature. 3. A – This patient currently has Ig M MGUS and is quite likely to develop Waldenström Macroglobulinemia. Just to recap he has an M protein on the SPEP but <30g/L and also <10% plasma cells in his bone marrow aspirate and biopsy. Additionally, he has no end-organ myeloma related involvement such as hypercalcemia, renal dysfunction, anemia or bone involvement (aka CRAB) Patients with MGUS should have a DXA scan at baseline as they are usually at increased risk for osteoporosis. Patients with MGUS have about a 1% annual risk of progression to a clinically relevant plasma cell dyscrasia. Ig M MGUS tends to transform to Waldenström Macroglobulinemia. Ideally patients should be monitored annually for any signs or symptoms of disease progression. Read more about Waldenström Macroglobulinemia here on Medscape.